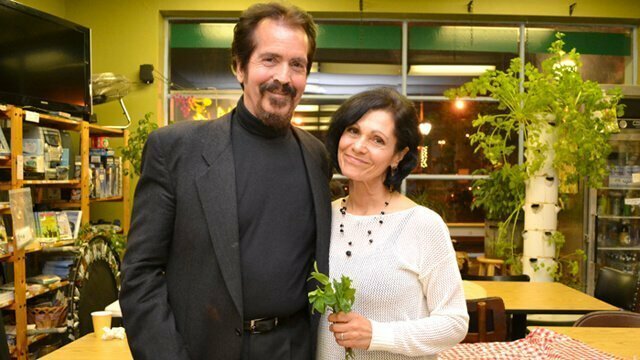 Tim and Leslie Arnold have run a combined 13,500 miles over the past four years, and this married Greater Philadelphia couple has achieved such fleet-footed success by leading raw vegan lifestyles. It should be noted that Tim’s over 60, and Leslie’s not telling. 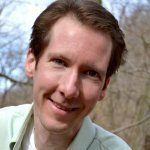 The Upper Darby, Pennsylvania, residents were vegetarians from the mid-1980s to late 1990s but returned to eating meat, in limited amounts, while living in London for several years, saying their lifestyle was “frowned on” to the point of almost crippling business meetings held over meals. When they returned to the United States in 2006, Leslie experienced chronic fatigue, and Tim was overweight, topping out at 280 pounds. Tim and Leslie Arnold pose after the October 2012 potluck at Arnold’s Way. 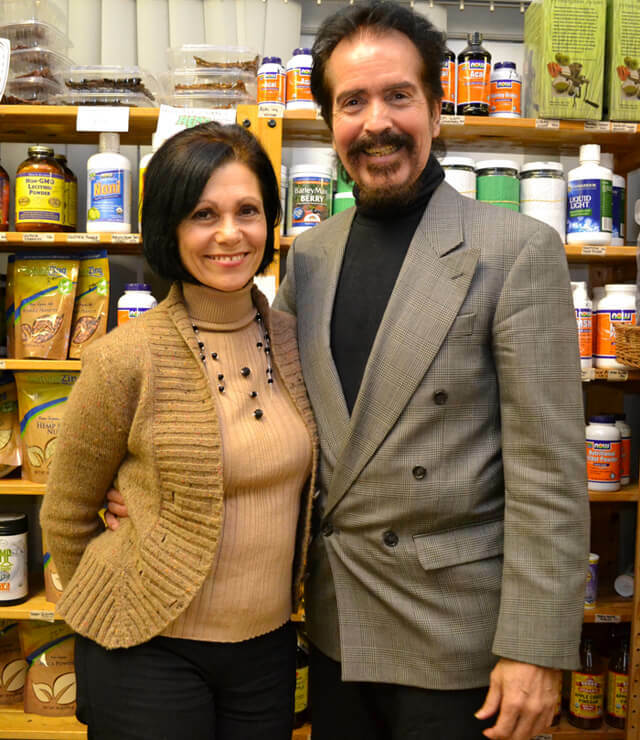 Leslie joined a friend who wanted to catch Victoria Boutenko‘s talk when the Green for Life author visited Arnold’s Way, a raw vegan cafe, in Lansdale, Pennsylvania, in January 2008. Within two months, they made the leap to a wholly raw vegan lifestyle and haven’t looked back. 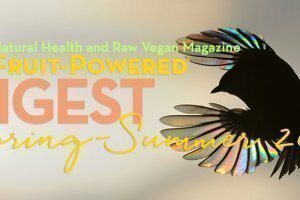 It took only about a week for Leslie to feel an energy surge after going raw, and she counts this benefit among the best she’s experienced leading a raw life. Tim felt a shift in energy, too. They began speed walking on a local track, and in July 2008, they pushed themselves a little more. 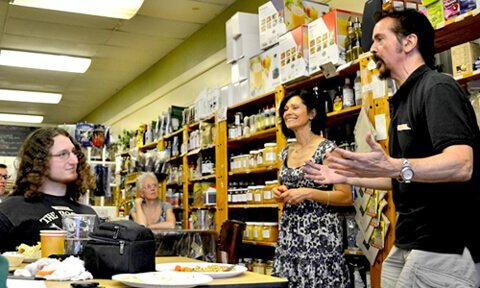 Tim and Leslie Arnold speak before patrons during the June 2013 potluck at Arnold’s Way. The Arnolds kept at it, picking up momentum at an age when most begin to slow down. It didn’t take long for them to discover that their so-called aging bodies were feeling younger and able to handle running far beyond their expectations. Leslie lost two pounds a month for almost her entire first year as a raw vegan. Tim dropped 145 pounds over his first 15 months. They each noticed nagging aches and pains disappeared in time on their diets and as they ran more and more. Leslie has run about 5,000 miles since she laced up her track shoes as a raw vegan and averages 25 miles over five days a week and 9-minute miles. She ran 10-minute miles in her 20s, when she would run 2 to 4 miles. Her husband has logged about 8,500 miles, averaging 50 miles a week and 6-minute miles, which he said are world-class speeds for his age group. He’s run 10 miles in 62 minutes—a minute off the world record for his age group, he said. The most he’s run in a week is 83 miles, and he’s achieved this feat twice. Tim runs 10 days and then takes a day off. 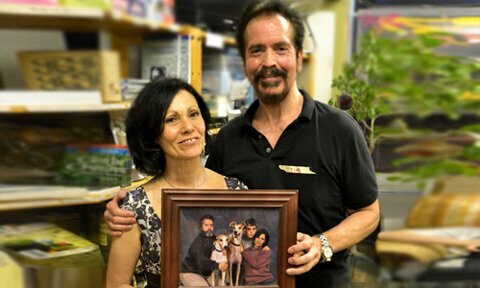 Tim and Leslie Arnold hold a photograph of their former selves after the June 2013 potluck at Arnold’s Way. Leslie has finished a half-marathon, and Tim has completed six full marathons, three in one month. He has also run 10 miles at least 400 times and once averaged sub-6-minute miles over a 9-mile run. When he was 27, he ran a mile in 3 minutes and 59 seconds—and promptly quit running. Tim ran a mile in 5 minutes and 44 seconds at 61. The Arnolds run mostly for their own enjoyment and say running along a beach is an enlivening experience. “Running barefoot on the beach is the very best,” Leslie said. “It’s so high-energy.” Tim said the ocean helps them run with abandon for any clock. “It feels like you can run forever,” he said. The Arnolds warm up with yoga routines stretching 20 to 30 minutes before setting foot on the track. They consume “carbo loads” of a half-banana, small handful of Himalayan sea salt and 10 to 12 ounces of water every 20 minutes while running. Each day, they drink about an ounce of water for every pound they weigh after hearing this advice from a holistic healer in Florida. 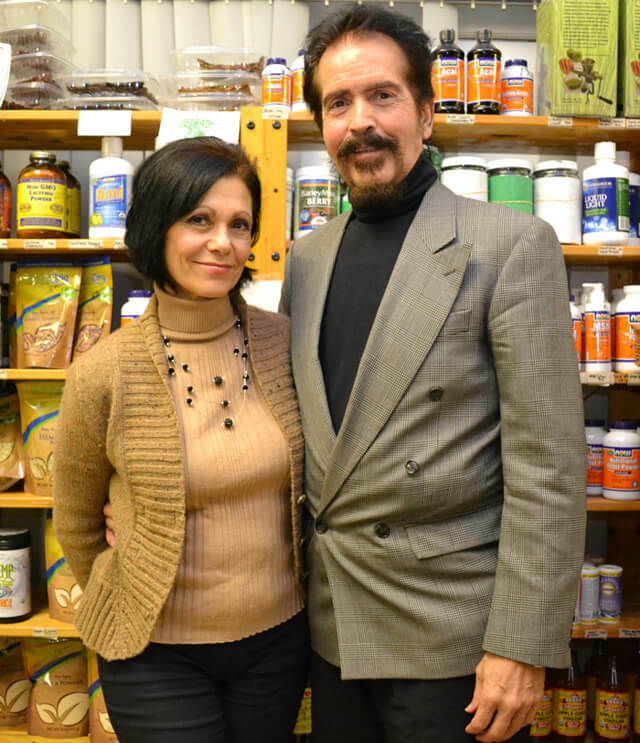 When they launched their raw vegan diets, the Arnolds consumed lots of fatty, salty fare known as “gourmet raw” such as almond butters and dishes doused with Nama Shoyu, marketed as containing unpasteurized soy sauce but loaded with a high amount of sodium. In time, they shifted to enjoying large green smoothies for every breakfast and have cut back on fatty foods such as avocados and dialed down the use of olive oil, especially in the past six months after experiencing weight gains of 5 to 10 pounds. Leslie’s favorite fruit is mango, and Tim’s is bananas, of which he eats about 15 a day. They also enjoy making a raw vegan version of ice cream using frozen bananas, a recipe they learned from Arnold Kauffman at Arnold’s Way, where they’re called Banana Whips. The Arnolds are regular patrons during monthly potlucks at Arnold’s Way. 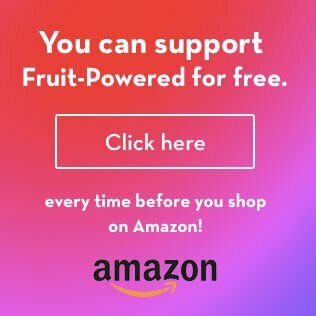 The story of their commitment to 100 percent raw veganism and fitness achievements—coupled with Tim’s massive weight loss—turns heads and inspires young and old to eat right and move their bodies to feel fabulous. 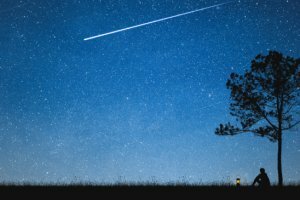 A great article and inspiring story. As a new runner this is getting me pumped up! Can’t wait for the next potluck.